Atlas Copco is reducing capacity at its facility in Örebro, Sweden, in response to continued weak global demand for mining equipment. The adjustment will affect an estimated 163 employees in Örebro. 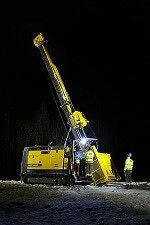 “The market for mining equipment continues to be weak, and we have to adjust capacity accordingly,” said Johan Halling, President of the Mining and Rock Excavation Technique business area. “It’s very unfortunate that some employees are directly affected, but we will do our best to support them in this difficult situation”. Employees and the local labor unions in Örebro were informed today that 110 blue-collar workers and 53 white-collar workers are affected. More than 1 700 people currently work at Atlas Copco Rock Drills AB in Örebro, which manufactures equipment used in mines and quarries as well as for construction.